Ringworm is a fungal (dermatophyte) infection of the skin, hair, or nails. It gets its name from its appearance on the skin. There are two main varieties of fungi causing dermatophyte infections: Trichophyton and Microsporum. Ringworm often looks like a ring-shaped rash. Ringworm is caused by several different types of fungi (molds). Other names for ringworm include tinea, dermatophytosis, athlete's foot (ringworm of the feet), and jock itch (ringworm of the groin). Ringworm cases have been given different medical names to describe the locations of the fungal infection. Thus, tinea of the groin is call tinea cruris after the Latin word for groin. Tinea of the scalp is called tinea capitis after scalp. Tinea of the body is called tinea corporis. Tinea of the feet is called tinea pedis. Tinea of the face is called tinea facei, and so on. Do you get the nomenclature? It is not caused by a worm! You can get ringworm from people, animals, or places. People get it through contact with a person who has ringworm, or by using items such as clothes, towels, or hairbrushes that were used by someone with a ringworm infection. Animals can carry some types of fungi on their fur or skin without showing signs of ringworm infection. Sick or carrier animals can transmit fungi to people by direct or indirect (hair or dander) contact. Places like gyms, shower stalls, and floors can transmit fungus if used by someone with ringworm. Other people can catch the fungus if exposed to these places. Ringworm is easily diagnosed. A doctor can do some simple tests to determine whether a rash is caused by a fungus. Ringworm is usually diagnosed by simple physical examination. Ringworm can show classic physical exam findings such as the erythematous scaled annular ring of the body or groin in tinea cruris, the dry fine scale covering the soles of the feet like a "moccasin shoe" in tinea rubrum, or the interdigital maceration and scaling found between the toes in athlete's feet. Interestingly, there is a classic fungal presentation called "two foot one hand disease" in which one hand and both feet are involved with fungus. Why both hands are not involved is a medical mystery. Treatment is usually an antifungal cream applied to the sites of infection, or pills taken by mouth. If you have ringworm, you can avoid spreading it to others by: Following Dr. Jacobs' advice for proper treatment: Keep your skin, hair, and nails clean and dry. Wash towels and clothing in hot water and soap to destroy the fungus. Stay away from common areas such as community pools and gyms until your infection goes away. Ringworm can be prevented by: Keeping common-use areas clean with bleach or Ajax cleanser. Using a floor and bath cleaner that contains a fungus-killing "fungicidal" agent. Avoid sharing clothing, towels, hair brushes, or other personal items. Tinea capitis is a fungal infection of the scalp. It consist of cutaneous lesions caused by various species of dermatophytes: Trichophyton and Microsporum. When the infection involves a man's beard, it is called Tinea barbae. Tinea barbae is rare, and most skin infections of the beard area are caused by bacteria, not fungus. Tinea capitis mainly affects children. Rarely, an adult can develop Tinea capitis. It is a contagious infection and may become an epidemic, being spread from child to child via hats or via the barber. Occasionally, children acquire the infection from cattle or domestic animals (dogs, cats). Tinea capitis infections can be grouped into four types based on presentation. The "black dot" type, the most common in the U. S., is usually caused by Trichophyton tonsurans. It is subtle in onset and characteristics. The inflammation is low-grade and persistent, the lesions are not annular or sharply marginated. Affected areas of the scalp show characteristic black dots resulting from broken hairs. The "gray patch" type is usually caused by the Microsporum species, Microsporum audouini or Microsporum canis. M. audouini lesions are small, scaly, semi-bald, grayish patches with broken lusterless hair. The infection may be limited to a small area or may extend and coalesce until the entire scalp is involved, sometimes with ringed patches extending beyond the scalp margin. M. canis usually causes a more severe inflammatory reaction with shedding of the infected hairs. The "kerion" type presents with the development of a raised, inflamed, boggy granuloma and is caused by Trichophyton verrucosum. It is seen, commonly, in children who have been in contact with cattle or other domestic animals. There is dramatic, acute folliculitis with pustules and swelling forming a boggy mass on the scalp. Hair loss and eventual scarring alopecia are common, but one attack usually confers subsequent immunity. Finally, the "favus (honeycomb)" type is due to infection with Trichophyton schoenleini. The characteristic features include extensive, even complete hair loss, scalp atrophy, and scarring leading to permanent alopecia, and the presence of yellowish, adherent scales or crusts (scutula) on the remaining hairs and scalp. The diagnosis may be made by presentation and examination of the scalp by physical examination, biopsy with special stains, fungal culture, or with filtered ultraviolet light (Wood's light). Tinea capitis caused by Microsporum species reveals bright green hair shafts. The Trichophyton species do not reveal much fluorescence, although T. schoenleini, the cause of the "favus" type, causes a dull green fluorescence. Tinea corporis and tinea cruris are fungal infections of the body & groin. They consist of cutaneous lesions caused by dermatophytes, a kind of skin fungi. When the infection involves the upper thighs or groin, it is called tinea cruris, commonly known as "jock itch". 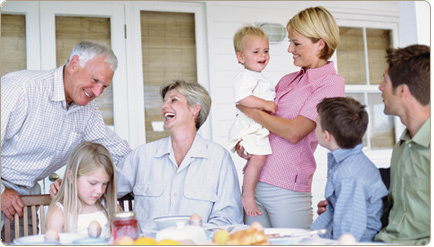 Tinea corporis can occur in people of all ages. Occasionally, people acquire the infection from cattle or domestic animals (dogs, cats). The infection can be acquired from animal contact, human contact, or rarely, from the soil. The infection usually occurs on the trunk, limbs, or face (facei), and often in other areas of exposed skin such as the arms or neck. Tinea corporis and tinea cruris can occur anywhere. The infections can also begin in the body folds such as the groin or armpits and may present as an itchy, scaly, red area with a raised, spreading edge with central clearing. The buttocks are a common location for tinea. These plaques may consist of pustules or vesicles. As already stated, when it occurs in the upper thighs or groin, it is called Tinea cruris or "jock itch". Tinea cruris can be aggravated by tight clothing, obesity, and warm climates. 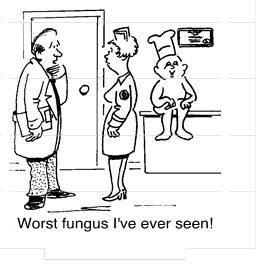 Humidity tends to favor growth of fungal organisms. Tinea Manus is a chronic fungal infection of the hands. It consists of cutaneous lesions caused by dermatophytes, usually Trichophyton rubrum. This fungus inhabits nonviable tissue like the outer layers of the skin and nails and generally does not invade living tissue. Tinea Manus is almost always associated with a pre-existing Tinea Pedis, or fungal infection of the feet. It is often on one hand only, and can involve the fingernails (Tinea Unguium). When unilateral with tinea pedis, the condition is called Two Foot One Hand Disease. One of the hardest to treat forms of external infection, onychomycosis, aggressively discolors, thickens, and destroys the nail plate. An estimated 10 million individuals in the continental United States suffer from onychomycosis. People who work with their hands or on their feet, or those who are frequently exposed to detergents, perspiration, and water, are at higher risk for contacting onychomycosis. Nail fungal infections are prevalent among the elderly, athletes, military personnel, and laborers, and may be more severe in immunocompromised patients, particularly those with HIV. In tinea manus, the skin lesions usually consists of red , flaky, scaling hyperkeratotic patches or vesicles in clusters. 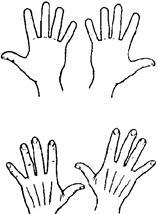 The condition is usually located on the palms or the dorsum and sides of the fingers. The infection often involves or spreads to the toe and fingernails (Onychomycosis) causing them to become thickened and lusterless. The nail plate can become thickened, separated, and destroyed. Usually the infection and skin lesions take months to clear and nail involvement may take up to a year. Quite often, the nails never clear. Occasionally, the Tinea Manus will be caused by a fungus that is resistant to griseofulvin. Most dermatophyte infections are superficial, but Majocchi's granuloma is a dermatophyte infection that goes a bit deeper than usual. Majocchi's granuloma (nodular granulomatous perifolliculitis) is a well-recognized but uncommon infection of dermal and subcutaneous tissue by fungal organisms (dermatophytes) usually limited to the superficial epidermis. Majocchi's granuloma appears as deeply set bumps associated with hair follicles of the skin. Because Majocchi's granuloma is a relatively uncommon lesion, most reports have included only a few cases, and the spectrum of disease, the organisms that cause it, and the population in which it occurs have not been well defined. The fungal organism usually associated with Majocchi's granuloma is Trichophyton rubrum. However, other dermatophytes including Trichophyton mentagrophytes (variety granulosum), Trichophyton violaceum, Microsporum audouini, Microsporum gypseum, Microsporum ferrugineum, or Microsporum canis may be the causative agent. Majocchi's granuloma occurs as a localized dermal infection, usually in individuals who have had chronic dermatophytosis but are otherwise healthy. 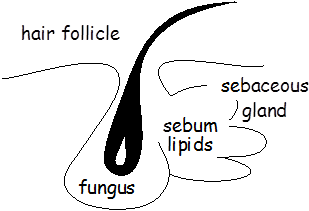 The initiating factor is thought to be physical trauma that leads either directly or indirectly to disruption of the follicle and to passive introduction of the organism deep into the skin, together with keratin and/or necrotic material into the dermis. Majocchi's granuloma requires oral therapy for treatment. Topicals are not effective. "Autosensitization dermatitis," also known as "autoeczematization," also known as the "Id Reaction" is the vesicular eruption sometimes seen in patients with an intense inflammatory process such as active stasis dermatitis or acute fungal infections of the feet. The vesicular eruption most often involves the sides of the fingers but can involve the entire body. Some feel that the "Id Reaction" is an allergic reaction to the fungi or some antigen formed during the inflammatory process. The vesicular eruptions disappear as the initiating inflammation disapates. The diagnosis of autoeczematization should be made only it there is an acute inflammatory process at a distant site, and the reaction disappears shortly after the acute inflammatory process is controlled. Autosensitization dermatitis (autoeczematization) is medically defined as the dissemination of a previously localized area of chronic dermatitis to distant areas of the skin. Autosensitization dermatitis generally appears as itchy grouped pruritic papules, papulovesicles, and eczematous patches on various regions of the body. Autosensitization dermatitis usually occurs suddenly, but may develop gradually in some cases. Autosensitization dermatitis is not an extension of previously localized dermatitis, per se, as there are "skip areas" of normal skin between the primary process and secondary occurence. The exact cause of this phenomenon is not known, but it may have a cell-mediated autoimmune mechanism. Autosensitization dermatitis may also occur as an allergic reaction to a fungal infection elsewhere on the skin. This type of autosensitization dermatitis is also known as a dermatophytid, or "id reaction." Although well documented, the "id reaction" is actually quite rare. The diagnostic criteria for a dermatophytid includes a proven fungal skin infection, a subsequent distant dermatitis devoid of fungal elements, and resolution of the distant eczematous reaction upon treatment of the primary fungal infection with appropriate antifungal agents. Again, the exact cause of this sort of socalled "autosensitization" is not really known. The successful treatment of autosensitization dermatitis "id reaction" with either an eczematous or fungal primary process lies in the treatment of the primary process. Once the original site is completely cleared through the use of appropriate topical (or systemic, in the case of some types of fungal infections) medications, the distant affected sites may usually be expected to clear as well. Concomitant treatment of the distant sites with topical steroids is often also helpful. Twice daily soaks of affected areas with Burow's solution, as well as Aveeno oatmeal baths for more widespread reactions, may also be helpful to relieve itching. If, however, clearing of the distant lesions does not occur once the primary skin lesions have been successfully treated, then, the diagnosis of autoeczematization is cast in doubt and other causative factors may be sought. How are tinea infections treated? Treatment of Tinea corporis can consist of topical antifungal creams or lotions or oral medications. The mild cases usually resolve within several weeks and topical treatment should be continued for at least 30 days after the lesions disappear. If the infection is more severe or resistant to topical treatment, oral medications may be indicated. For tinea cruris, non irritating topical creams or lotions may be indicated. If there is no response, or if irritation from the topical antifungals develops, oral medications can be used. Tinea cruris lesions may become complicated by secondary bacterial or other yeast or fungal infections, and recurrence is common. Treatment of tinea capitis and tinea barbae usually consists of oral medications, usually Griseofulvin for 1 to 2 months, or until the infection has cleared. Topical antifungal creams or lotions may be helpful in preventing spread of tinea capitis to other children. Oral antibiotics may be needed to treat tinea barbae if secondary bacterial infection is also present. Also, oral steroids may be needed if severe disfiguring inflammation is present on the scalp or face. Onychomycosis usually requires longer term therapy with oral medications. Sometimes, the risks of liver inflammation or drug interactions is not worth the benefits, and Dr. Jacobs may suggest control with topical gels or solutions. A Word About Oral Medications: If your tinea is severe, Dr. Jacobs may discuss with you the possibility of using oral medications to treat your infection. There are three main oral medications used in the treatment of tinea: Griseofulvin, Nizoral Tablets, Lamisil Tablets, and Sporanox Capsules. As with any medical decision, one must always weigh risks and benefits when deciding on choosing a particular form of therapy. The oral medications do have possible side effects that you should be informed of. You should not use alcohol with these medications. You should inform Dr. Jacobs if you have any history of alcohol intake, liver disease, hepatitis, or any chronic diseases. All oral antifungal medications are listed as able to cause side effects involving allergies, death, changes in blood count, kidneys, and skin. Please read the package inserts for details. Your pharmacist can also give you an informational sheet for each drug in question. Of note, Nizoral is known to cause liver toxicity and inflammation in 1 in 10,000 patients. This has been fatal in certain patients, even after taking the medication for a short time. Lamisil Tablets, and Sporanox Capsules can cause the same, but the incidence is much less, and these are considered safer medications for long term use. To a lesser degree, Griseofulvin is also known to cause liver toxicity and inflammation. Griseofulvin does have a cross reactivity in patients who are allergic to penicillin. If the benefits outweigh the risks in your condition, you may want to take an oral medication for your infection. Dr. Jacobs may order blood tests, initially, or after two weeks, and then periodically for Nizoral Tablets, Lamisil Tablets, and Sporanox Capsules. Dr. Jacobs may order blood tests, initially, and then at monthly or six week intervals for patients requiring Griseofulvin for longer than 3 weeks. 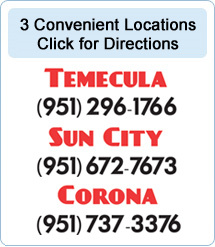 If you have any further questions, please ask Dr. Jacobs at your next appointment. He will be happy to help you.